We offer many spare parts for UV curing systems including power supplies, lamp holders, reflectors, mirrors, mercury relays and many other useful parts to repair, refurbish and keep your uv system operating in an efficient way. See below for more details. 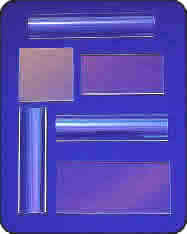 We distribute a wide variety of standard and custom UV/mirrors/reflectors and IR Hot Mirrors. Our manufacturing facilities use only the best coating process and highest quality materials available. We currently offer thin film coatings on fused quartz or on many Borosilicate types of glass. Our technical sales team can accommodate customers with established cold UV technology solutions as well as assisting other OEM's who are new to cold UV applications. We are always available to help with any new designs or concepts that require the assistance and skills of our manufacturing engineers. Cold UV Mirrors are available in flat or curved profiles on fused quartz, with angles of incidence of 0, 21, or 45 degrees. IR (hot) Mirrors are presently only available on flat fused quartz with either 0 or 45 degree angles of incidence. Special custom coatings with custom angles of incidence may be available, please enquire. Quartz glass offers a variety of UV filtering, transmission and temperature resistance qualities to suit individual applications. Choose from a full range of QUARTZ FILTER MATERIAL in custom-cut sheet form that meet and exhibit specific wavelength characteristics based on the specifications you provide. Whether you require UV or IR filtering characteristics, we can supply the right material. These quartz sheets are offered as a replacement part of OEM equipment, and are custom made to supplied specks. We offer a variety of quartz materials and competitive pricing, for both small and large quantities. Please call us or email sales@epakelectronics.com for a quote. Made of 100% silicone rubber, HEAT RESISTANT SEALANT serves as an effective adhesive for resealing wire ports within your curing unit and power supply. 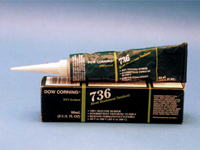 The sealant remains permanently flexible and can withstand temperature from -85° to 500° F (-65° to 260° C). Resists intermittent exposure to 600°F. Available in 90mL/3 oz tube. CON-TROL-CURE® Braided FIBERGLASS SLEEVING is designed to protect heat sensitive wiring from high temperature applications to 1200°F. 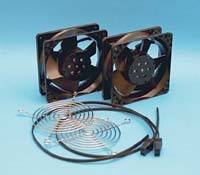 It also provides additional insulation protection for high voltage wires. 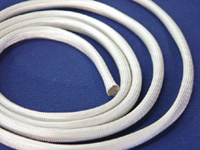 It is extremely flexible, tightly braided, non-flammable, class-C fibreglass. The glass braid is fray resistant and non-corroding. The durable material does not support combustion or fungus growth. Available in I.D. sizes: 0.022" to 1.018" Stock size is .186 available by the foot. All other sizes are sold by 100 foot roll. Standard Colour: Natural. Additional colours available to order. By controlling voltage output of your UV curing system's power supply, CAPACITORS are a critical component to consistent curing performance. The complete line of CON-TROL-CURE® Capacitors suits the specific switching requirements of most power supplies available today. If you aren't sure of your specific needs, we can help you determine which unit or combination of units would best suit your needs. We are confidant that we can obtain any capacitor(s) you need. 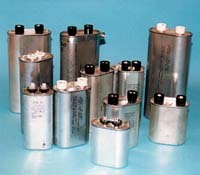 Visit our web site or call us to place your capacitor request today. CONTACT US FOR MORE INFORMATION ABOUT CAPACITORS FOR YOUR SPECIFIC APPLICATION. As compressed air flows through the inlet and into a plenum chamber, it is throttled through a thin nozzle extending the length of the Air Knife. This primary air stream adheres to the coanda profile which turns it 90°, and directs it to flow down the face of the knife. The primary stream immediately begins to entrain surrounding air, while velocity loss is minimized through the wall attachment effect. 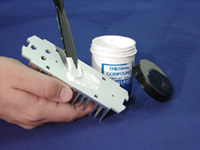 When installing electrical components within your power supply or lamp housing, CON-TROL-CURE® HEAT SINK COMPOUND can help minimize the risk of heat damage and prevent discoloration, warping, buckling, or other distortion of light gauge metals. It confines heat to the welding, brazing, or soldering zone, protecting adjacent areas from destructive heat build-up. Harmless to skin, odorless and non-toxic, it will not stain the base metal. To clean, wipe off excess and wash with water. Available in 8 oz tub. CON-TROL-CURE® stocks hard-to-find MERCURY RELAYS designed to handle the high power needs of UV lamp switching. Excellent for use with UV curing lamp controls and panel safety switching. Contactors are hermetically sealed with high quality glass to metal seals. 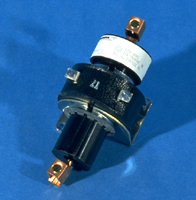 Easily mounted on most enclosure panels, these relays offer the dependability of mercury technology. 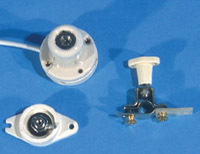 Terminals are standard pressure connectors and leads are 5000V AC rated. 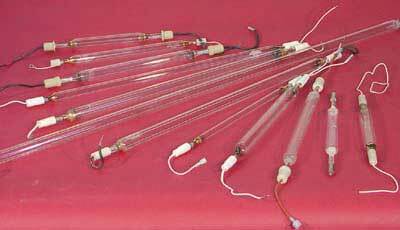 Select the right replacement UV LAMP HOLDERS for your metal and ceramic end lamps. We offer 3 different models which are OEM-compatible replacements for a variety of UV curing systems.